Two weeks after Typhoon Haiyan devastated the Philippines, more than 3.2 million women and girls of reproductive age are still in need of urgent care and protection, the United Nations population agency today said, launching an appeal for $30 million to provide services and aid during the next six months. An estimated 230,000 pregnant women are currently in affected areas, while 835 women are giving birth every day with very limited access to emergency obstetric care, according to the UN Population Fund (UNFPA). With most health infrastructure destroyed and uncertain security, the UN agency is working with national authorities and partners to develop a $110 million plan to ensure that no woman dies giving birth and that each woman and girl is protected from violence at home and in her community. 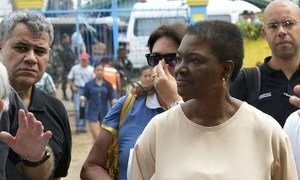 Approximately 397,000 women and girls would have experienced sexual violence in the affected areas prior to the disaster, UNFPA said citing national figures. “With displacement, this number could increase by 65,000 without adequate services to prevent and manage violence against women,” it added. The UN agency said the urgently needed funds will allow it and partners to provide life-saving maternal health services, dignity kits for women of reproductive health which include sanitary pads and soap, as well as kits for pregnant and lactating women. UNFPA's appeal comes one day after the UN humanitarian arm (OCHA) increased its call for funds from $301 million to $348 million, and said that the figure is likely to increase further. Typhoon Haiyan, which struck on 8 November, killed thousands of people and affected 13.25 million overall. The Government yesterday raised the death toll from Haiyan to more than 5,200 as it still tries to verify the total number of dead and missing, with communities on remote islands or in mountainous areas still not reached. Over 5 million of those affected are children, and more than 4 million people have been left homeless with over 1 million homes destroyed. The United Nations today increased its appeal for Philippines typhoon relief by nearly 16 per cent to $348 million with a further rise likely as aid organizations move into top gear in the face of a disaster that killed thousands of people and affected 13.25 million overall.